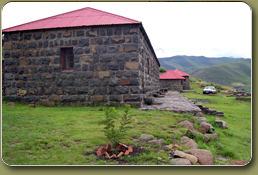 St James Guest Lodge is a small stone self-catering establishment able to accommodate up to 16 guests. There is no electricity at the lodge, lighting is paraffin lamps and candles and water is heated in a coal-burning boiler. The lodge is conveniently situated 11km outside of the town of Mokhotlong (largest town in the region), 1hr drive from the infamous Sani Pass, 4hr30 from Katse Dam, 3hr30 from the winter resort of Afriski, and 8hrs from the Lesotho capital of Maseru. The majority of our clients are nature lovers, intrigued by the simple life and humility of the Basotho people, who generally stay only 1 night while passing through the country and contributing in some small way to the welfare of the Basotho people. We have a variety of ongoing projects which we post on our website. We are a small and basic accommodation establishment created to support the community in a region once referred to as 'The most remote outpost of the British Empire'. A large portion of our income is used to subsidize humanitarian projects in the Mokhotlong Region in Lesotho. Through our clients, we support the local community by collecting resources necessary for their survival (clothing, blankets, food supplements) as well as educational equipment for the local schools.A large portion of our income is used to subsidize humanitarian projects in the Mokhotlong Region in Lesotho. Through our clients, we support the local community by collecting resources necessary for their survival (clothing, blankets, food supplements) as well as educational equipment for the local schools.